As at May 2007 advertised for sale by Cheshire Classics - "CHASSIS NUMBER 8301 - The first 3 litre (H16) BRM built. It was used in the initial test and development work, and attended nearly every Grand Prix during 1966 and 1967  driven by Hill, Stewart, Spence and Irwin. Uniquely, the car was then converted by the factory to F5000 specification and subsequently raced by Terry Sanger. It is offered as a substantially complete car, the only significant items missing being the gearbox, master cylinders and a radiator. The car requires some mechanical restoration but has refurbished and repainted bodywork. It has a chassis plate and continuous history from new. 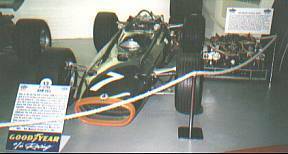 A P83 which can correctly be run without an H16 engine for £90,000"
After its Formula One life 8301 was bought from BRM in October 1968 by Colin Crabbe and converted it into a F5000 car in his workshops using his spare GT40 Ford 289 engine and ZF gearbox. The car was later sold (with a complete spare monocoque) to John T Williamson in June 1969. On the left is the car beside the 4 valve H16 engine that was the last development of the engine. On the right a close-up of the H16 engine and suspension. 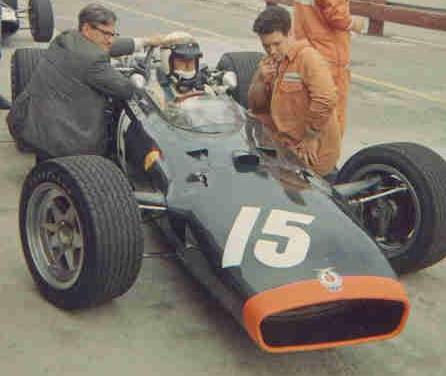 After its formula one use the car was driven by Peter Gerrish in F5000 with a Rover V8 3.5 litre engine. Said to be the largest private selection of cars in Britain - in the grounds of a moated castle. Should be open from May to September (except Saturday). As at May 2007 advertised for sale by Cheshire Classics (see photo above) - "PROJECT 109 - This 1967 car was prepared as an exhibition version of the H16 engined P83 for Expo 67 in Montreal, and has never raced. It is offered as a rolling chassis for restoration. The car is substantially complete apart from engine and gearbox, and is in generally good order throughout. It has a chassis plate and continuous history from new. A must for the serious BRM collector at £60,000"
Was previously displayed at the York Motor Museum, Western Australia, Australia. Canadian GP August 1967 - Jackie Stewart in the H16 "lightweight" with Tony Rudd (left). P115 At the first Canadian GP at Mosport near Toronto. Jackie Stewart in the only P115 (1151) - the lightweight, slimmer car. The race weekend was wet and added to the problems of setting cars up for the tricky and testing track. Stewart quallified 9th., Spence 10th. and Irwin 11th. Stewart managed to get as high as fourth. On lap 64 of 90, while fighting for second place, he slid off the track. Although no damage was done, the throttle slides were covered with dirt. Despite attempts to clear the sticking throttles, Stewart was forced to retire. Spence finished 5th. after one of his many solid finishes in the difficult H16. Irwin had retired after a spin on lap 18. The car was part of the Bourne parade 29th. August 1999 thanks to Hall & Hall restorers. The original P83 weighed 1480lb. Chassis P115 Engine P75 The "lightweight" was specially made for Jackie Stewart's 1967 season. The magnesium-alloy monocoque saved 120lb. over the standard chassis. Owner/driver Peter Hannen ran the car at the 1994 Goodwood Festival of Speed for it's first outing since 1968. The car was renovated and race prepared by "Hall & Fowler" in 1996. Front Track 59in. Bore 69.88mm. Rear Track 60in. Stroke 48.89mm. Width 66in. Power 405bhp. @ 10,500rpm. BRM had one of the new cars (P83 - 8301) ready and running at this first race of the Championship year. It was never intended to race the new car but the only way to find out where a car stands against the opposition is in competition. 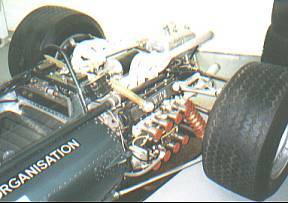 Lotus had their first H16 engine delivered a few days before the race and the Lotus 43-BRM H16 was not taken to the race. The BRM H16 was described as running sweetly up to 7,000rpm after which, it began to hurt the ear-drums. Hill reported that the engine ran smoothly up to 10,500rpm. Hills V8 time put him fourth on the grid  the H16 time would have been too slow to qualify. 1min. 42.2sec. in the camera car for film GRAND PRIX (which has action shots of P261 V8 and P83 H16). In the race the Owen Organisation team relied on the tried and trusted (and nimble) P261s in 2 litre Tasman form. With such a competitive car the team would have to think twice before commiting to the heavy and complex P83. Fastest Lap  Lorenzo Bandini Ferrari V6 2.4 litre  1min. 29.8sec. 16 starters  4 finishers. Stewart set the pace in his BRM at the start of practice  but in the 2-litre P261 not the P83 H16. Peter Arundell did a few laps in the H16 powered Lotus but then suffered an engine problem and took no more part in the event. Hill and Stewart tried their H16s on both practice days but concentrated on the improved cars from the previous formula. The official timekeepers did not give separate times for the different cars of the BRM drivers but the V8s proved faster than the new and complex H16s. So none of the three H16 powered cars present found their way to the starting grid. The race, as shown by the live action used in the film Grand Prix, was hit by a rainstorm partway around the first lap. The three BRMs in the race all spun on the Masta Straight. Hill managed to stay on the track and was about to continue when he saw that Stewart had wrapped his car around a telegraph pole and was trapped in the wreckage. After helping extract his petrol soaked team-mate, Hill drove his healthy car back to the pits to retire from the race. ..2 hrs. 09 min. 11.3 sec. Fastest Lap - John Surtees Ferrari 312 V12 - 4 min. 18.7 sec. 15 starters  5 finishers. Eight BRM engined cars arrived at the Spa circuit  not one managed to get to the end of the first lap. Not a good weekend for the team. A good weekend for motor racing  the safety campaign worked on by drivers such as Hill and Bonnier  was pushed through by Stewart after his experiences at Spa. Would we still have F1 racing if a several drivers were killed or maimed year after year? After his crash at Spa Stewart was absent whilst undergoing repairs. Hill had his P261 and the two H16s (8301 & 8302). Wednesday practice Hill did a few laps of the high-speed curcuit in the two H16s his bet lap being 2min. 15.2sec. compaired with his P261 time of 2min. 14.0sec. and the fastest of the day of 2min. 10.7sec by John Surtees in the Cooper T81-Maserati V12. Arundell did not even get the H16 powered Lotus on to the track as the distributer drive sheared whilst still in the paddock. Thursday practice Arundell did get the H16 powered Lotus on to the track but his exit from the pits in the wrong gear resulted in a burnt out clutch and no proper time being recorded. Hill had a better time with the second H16 with the gear change mechanism converted since Spa to rods from cable. The gear change was still a problem with his best time being 2min. 16.0sec. against 2min. 13.0sec. in the P261 and the fastest of 2min. 08.4sec. by Surtees. Friday practice Hill tried Firestone tyres on the newer of the H16 and worked away on tuning the car with a few laps at a time until finally he came past the pits of the long main straight on song. The H16 was clearly the fastest car at the track with a top speed estimated at 188mph. Due to transmission problems Hill was forced to use very slow gearchanges and hold the car in gear. Even with those handicaps his laps of 2min. 09.4sec. and then 2min. 09.2sec. were second fastest at the time. His fastest time in the P261 was 2min. 12.8sec. Arundell had the H16 powered Lotus sheared its distributer drive again but managed to record a much better time. Due to the continuing gear selection problems with the faster P83 H16, Hill was to race the old P261. .1 hrs. 48 min. 31.3 sec. .14 lap broken inlet camshaft after disputing third place. Fastest Lap - Lorenzo Bandini, Ferrari - 2 min. 11.3 sec. 17 starters  8 finishers. The works P83s and the Lotus 43 were absent as the transmission problems required major work to correct. On the twisty Kent track the two litre cars BRMs were not at a great disadvantage. The works team was rewarded with a solid third place. .2 hrs. 13 min. 13.4 sec. Fastest Lap - Jack Brabham Brabham-Repco V8  1 min. 37.0 sec. 20 starters  13 finishers. The works P83s and the Lotus 43 were again absent as the transmission problems required major work to correct. The works team relied on the two litre central exhaust Tasman P261 BRMs. Team Lotus had Lotus 33 (R11) with a low-level side exhaust 2 litre B.R.M engine and BRM gearbox.
. 1 min. 32.0 sec. ..2 hrs. 20 min. 32.5 sec. Fastest Lap - Denny Hulme, Brabham-Repco V8 - 1 min. 30.6 sec. 17 starters  9 finishers. The works P83s and the Lotus 43 were still absent as the transmission problems required major work to correct. Hill suffered a broken crankshaft in final practice. Hill started the race on Goodyear tyres and Stewart on Dunlop. ....... Lotus 25 (R3)-BRM-V8 2-litre...... 8 min. 38.6 sec. Peter Arundell....... Lotus 33 (R11)- BRM-V8 2-litre... 8 min. 52.7 sec. ..raced the Cosworth powered car instead. 2 hrs. 27 min. 03.0 sec. 2 hrs. 33 min. 44.4 sec. 2 hrs. 35 min. 31.9 sec. ....1 lap Accident  during a rain soaked first lap another car clipped a front wheel of Taylors car spinning him into a firey crash in which he was badly burnt. Fastest Lap - John Surtees, Cooper-Maserati, 8 min. 49.0 sec. Jean-Pierre Beltoise, Matra-Ford F2, 9 min 29.4 sec. 18 starters  8 finishers (F1). 9 starters  4 finishers (F2). The works team arrived with three H16s - 8301 & 8302 and also 8303 a new car with the engine set up with full 16 cylinder ignition timing. The BRM transmission unit had been redesigned to overcome the earlier gear-change problems. The early design had clutch and flywheel unit linked to the gearbox internals. This was changed to be linked to the engine output shaft, which slowed the workings with the engine enabling quicker gearchanges and reduced damage to the previous over speeding cogs. Friday practice Hill did not get far due to a broken gearbox (1min. 34.7sec.)  Stewart went a little better (1min. 34.6sec.) but Clarks H16 powered car was near the front at 1min. 32.9sec. As the original H16 was unavailable due to gearbox troubles at pre-race testing Hill brought one of the old P261s out of retirement as back-up. Saturday practice Clark had a fast and reliable afternoon in his H16 powered car apart from a minor gear linkage problem. The works team were having a hard time as even the reliable old P261 had a blown engine after Hill set a time of 1min. 33.4sec. in it. Stewart used the only working H16, which was Hills latest car with the engine and transmission unit from Stewarts 8302. Two P83s were back in working order for the race, with Hill back in 8303 and Stewart in 8302.
. 1 min. 32.81 sec.
. 1 min. 33.40 sec. The race Clark went to the grid with worries about fluctuating fuel pressure and made a terrible start  but set a fast pace once properly under way. Hill did not complete the opening lap due to an engine blow-up. Stewart retired from the mid field when he was soaked in leaking fuel. Clark was up to the leading pack in fifth place but pitted on lap 13 to change an out of balance tyre. After circulating at high speed but far behind, Clark was troubled by gearbox troubles and finally retired with the car stuck in gear. Fastest Lap - Ludovico Scarfiotti, Ferrari, 1 min. 32.4 sec. 20 starters  9 finishers. The works cars had early versions of the engine with ignition timing as double flat eights. Jim Clark was entered in the BRM H16 powered Lotus 43/1 but the car had problems in practice and Clark took over Arundells Lotus 33 (R14)-Climax V8 for the race.
. 1 min. 35.4 sec. The race From the start the two works H16s were breathing down the neck of leader Brabham. On the fifth lap BRM were in the lead with Stewart. The leading pack were still tightly grouped when Stewart dropped back with rising water temperature. Hill moved up and was in front from lap 10. Stewart retired on lap 13 with overheating, while the P83 of Hill continued to lead. On lap 18 Hill was demoted to a close second by Brabham and held on until lap 25. The H16 was out with a broken engine after a demonstration of the power of the H16 when it was on song. For both Hill and Stewart to lead the nimble Brabhams around the twisty track pointed to a bright future for the H16. Fastest Lap - Jack Brabham & Denny Hulme, 1 min. 36.6 sec. - 102.89mph. 10 starters  5 finishers. Fridays practice started with Clark fastest at 1min 11.13sec.in the BRM H16 engined Lotus, which was actually entered as the car for Arundell. At the end of the day Graham Hill was down to 1min. 8.87sec. and Stewart set a time of 1min. 09.97sec. Saturday practice closed as the track dried out and times dropped. The session ended with Clark in the H16 managing to record 1min. 08.53sec. to join Brabham on the front row of the grid. As Clark cruised back to the pits something went wrong with his BRM engine and, on inspection, oil was found seeping from one of the four banks of exhausts. BRMs spare mint condition engine was passed to Lotus to fit into their type 43 for the race. 1 Jack Brabham..............Brabham BT20-Repco V8...................1 min. 08.42 sec. 5 Graham Hill...................BRM-H16 (8302)................................1 min. 08.87 sec. 6 Jackie Stewart...............BRM-H16 (8301)................................1 min. 09.17 sec. 10 Pedro Rodriguez..........Lotus 33-BRM V8...............................1 min. 10.40 sec. 12 Mike Spence................Lotus 25-BRM V8 2-litre....................1 min. 10.73 sec. 17 Innes Ireland..............BRM-V8 2-litre....................................1 min. 12.63 sec. After working overnight to replace the wrecked H16, Lotus had still not decided if Clark should use the 3-litre type 43 or the 2-litre type 33. The choice was second on the grid with the fast but fragile 3-litre H16 (with the engine change still not completly installed) or a tenth place start in the slow but reliable 2-litre Coventry-Climax. Working on the H16 until the last minute Clark only took his place on the grid as engines were started for the warming-up lap. Even then oil was leaking from the engine and only work on the grid itself stopped the problem as the cars started their warm-up lap. The Race At the end of the first lap the order was Bandini(Ferrari), Clark(Lotus-BRM H16), Ginther(Honda), Brabham(Brabham-Repco), Surtees(Cooper-Maserati) and Stewart(BRM H16) and Hill(BRM H16). As the leaders began to lap the tail-enders. Brabham and Bandini, passed Arundell(Lotus), but both Surtees and Arundell spun off the track. They both managed to return to the pits and after safety checks Surtees restarted in 13th position, three laps behind. Lap 13 - Gurney retired his Eagle-Weslake V12 with a slipping clutch due to an oil leak. Lap 18 - Hulme retired his Brabham-Repco V8 due to low oil pressure. Bandini lost the lead on the 35th lap with a major Ferrari engine blow-up. This left Brabham with a fair lead over Clarks Lotus-BRM H16 and then a distant Stewart in the BRM H16. On the 53rd lap Hill, after earlier gearbox problems, retired with a broken crown wheel and pinion. On lap 54 Stewart came to a halt leaking oil and water due to a suspected shattered cylinder liner. On lap 55 Brabham came into the pits to retire from the lead with a broken camshaft in his Repco engine. This left Clark with a large lead, his H16 BRM engine running perfectly (so far!). After the retirement of a number of the main contenders the race then settled down to a test of stamina. It is important to remember that 1966 was the first year of the 3-litre formula and most engines were untried and complex. Unlike current F1 the cars these had to be nursed to the finishing flag, those who drove at 100% all the way greatly increased the chance of mechanical failure. Clark took the flag with the BRM engined car at least a lap ahead of all the other runners. Click here for the story of the race. ....Lotus 43-B.R.M. H16 (43/1)...........2hrs. 09 min. 40.1 sec. Fastest lap - J. Surtees (Cooper-Maserati V12), 1 min. 9.67 sec. 19 starters  6 finishers. The works team had all three P83s back in working order, with Hill back in 8303 with the true 16 cylinder and Stewart in 8301 & 8302 with the earlier double 8 engines. Friday practice The P83s were suffering from handling problems and Stewart had the nose of his car removed to combat overheating. Clark set a fast time (1min 54.06sec.) in the BRM H16 engined Lotus when the engine blew up in a big way. The engine was the one that had won in the USA and had covered about 300 limes since a rebuild  the same distance as Stewarts USA blow up. Both units were destroyed by crankshaft balance weights and their bolts failing. Later 8pin self balancing crankshafts were intended to solve the problem. Until then 300 miles was all that could be expected from an engine.At the end of the day Graham Hill was down to 1min. 59.24sec. and Stewart set a time of 1min. 56.64sec. Saturday practice All three H16 powered cars improved their times. The two works cars were ominously leaking oil, but this proved to be a minor problem of a leaking plug in the oil pressure relief valve. 1 John Surtees...........Cooper-Maserati V12...........1 min. 53.18 sec. 2 Jim Clark.................Lotus 43-BRM H16..............1 min. 53.50sec. 7 Graham Hill .............BRM-H16 (8302).................1 min. 54.61 sec. 10 Jackie Stewart.........BRM-H16 (8301).................1 min. 55.90 sec. 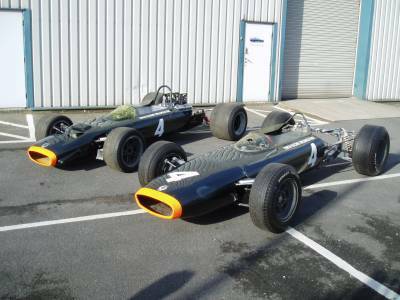 16 Innes Ireland..........BRM-V8 2-litre.....................1 min. 57.46 sec. 17 Peter Arundell.......Lotus 33-BRM V8.................2 min. 00.79 sec. dns Mike Spence..........Lotus 25-BRM V8 2-litre.......1 min. 55.98 sec. (Reg Parnell Racing) Withdrawn after practice crash. The Race At the end of the first lap the H16 situation was, Clark sixth with gear change problems, Stewart seventh and Hill 12th with a misfiring engine. A broken gear selector caused Clarks retirement on the 9th lap. Stewarts engine was leaving a smoke haze behind it but still managed to move up to fourth by lap ten. Hill retired on the 18th lap, his weak engine finally clattering and clanking. On lap 25, Stewart moved up to third and was closing quickly on the leading pair when the H16 had finally burnt off all its oil and came to a halt on the 26th lap. ..2hrs. 06 min. 35.34 sec. Fastest Lap - Richie Ginther, Honda 1 min. 53.75 sec. 18 starters  8 finishers. The H16 cars had a life after Formula One once set aside by the works team. The complex screaming sixteen cylinders were replaced by thumping V8s for F5000 racing (5 litre "stock block" engined open wheel racing cars). The engine to have in this series was the Chevrolet - in 1969 the John T. Williamson owned P83 was the best of the Ford powered cars. 1 Trevor Taylor................Surtees TS5-Chevrolet V8......................1hrs. 6min. 55.0sec. 1 Trevor Taylor.............Surtees TS5-Chevrolet V8.........................58min. 06.3 sec. 1 Trevor Taylor.............Surtees TS5-Chevrolet V8.........................58min. 34.3 sec. 1 Mike Walker.............Lola T142-Chevrolet V8...............................1hrs. 03mins. 10.0sec. 1 Mike Hailwood..........Lola T143-Chevrolet V8...............................1hrs. 02mins. 01.6sec. © David Hodgkinson 2000-2007. All rights reserved.